Hope you've all had a lovely day. I've just got back from having dinner at a country pub we always go to, it's been warmer again today so it's been nice to wear no leggings again! I wore a long sleeved skater dress with a cardigan and flip flops. Even though it was the evening it was nice, and that's the kind of weather I love. I have two polishes to show you today. I bought these a little while ago and swatched them as soon as I got them. I made an order on the Models Own site for a few polishes and included Black Magic in the order. I have quite a few black polishes because I have a lot of special effect topcoats to go over them, and I really get through them, and I was down to only one bottle of Gold By Giles Black. My Rimmel Black Out was finished and I was starting to get panicky. Then I got my order and they had put Matt Black in by mistake! I had never owned a matte polish because I wasn't sure I liked the effect so I emailed them letting them know of the mistake. They emailed me back within half an hour saying sorry and telling me to keep the Matt Black. My replacement Black Magic arrived the next morning, I was so impressed! 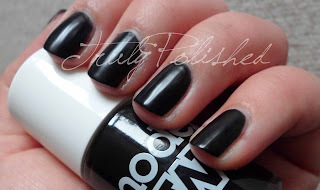 Black Magic is a glossy black polish that is highly pigmented. It went on very easily in two coats and dried very quickly with a super glossy effect. I didn't use topcoat for the photos below but if I was wearing this for longer then I would. I thought I should include a photo of the Matt Black polish as well. The formula of this was pretty good, it went on with two coats. I found I struggled with the matte finish because it dried quickly so I sometimes found that with my application method, it looked uneven and I could almost see brushstrokes. Also, the matte finish wasn't as matte looking as I thought, it looked more like rubber. The photo below shows two coats with no topcoat in natural light. All in all, I'm pleased with both polishes. Black Magic is super glossy with a good formula, and Matt Black looks nice if you apply it carefully. I think I'll probably use the matte finish one for layering because I'm not sure I'll get enough wear out of it otherwise! Both polishes are available on the Models Own site and in selected Boots stores where it retails for £5.